Trying something different with this one. We’re talking about GenCon, which is quickly approaching, and GenCan’t, which is also just as quickly already happening to you right now. Place soup pot on stove, over high heat. Add 2 Tbsp olive oil, a dash of veggie broth, onions and flour. Whisk quickly to form a roux. Once you have a thick creamy flour roux, you can add in more ingredients: all the remaining ingredients except the pasta and half of your purple kale. This includes: pepper, sea salt, creamer, chopped garlic, dried rosemary (crumble into a powder), harissa, vinegar, remaining olive oil, 2 cups of the purple kale, white rice, saffron, mushrooms, spicy sausage, bouillon cube, water, corn, peas, carrots, brewers yeast, tomato/pepper and remaining veggie broth. Optional sweet potatoes and cheese can go in as well. 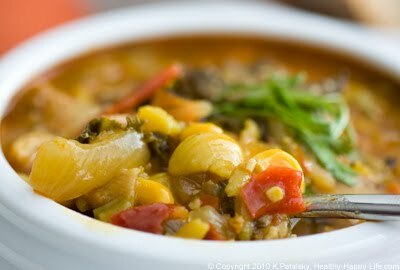 Bring soup to a bowl, stir well, cover and reduce heat to a simmer for 20 minutes. This will allow the flavors to merge and the rice to cook. After the 20 minutes are up, add in the pasta and remaining kale. Cover again and cook on medium heat for ten minutes. You may want to add in another cup of water- only if too much steam has reduced the soup too much. Do a quick taste test and adjust salt/pepper as needed. Pour steaming hot soup into bowls and garnish with fresh chiffonaded arugula or chopped parsley on top. Enjoy! Save leftovers for the best next-day-lunch ever. Reheat Tip: add water/veg broth to re-hydrate stew.